After independence from Portugal in 1975, Mozambique suffered a 16 year civil war. The war ended in a peace deal in 1992 when a communist government took control. The HIV/AIDS pandemic then crippled the country, especially in rural areas where many people in the labour force died, leaving the elderly and vulnerable children to fend for themselves. Mozambique has transitioned from a post-conflict country to one of Africa’s fastest growing economies. However, the rapid economic expansion over the past twenty years was very limited to the area around Maputo, the capital, due to its close proximity to South Africa. Every year, entire communities in Mozambique face a season of hunger when their food supply runs out. 43% of children in Mozambique are stunted due to malnutrition. Limited progress has been achieved in improving water and sanitation and alleviating hunger and malnutrition. Malaria remains the most common cause of death in Mozambique, responsible for 35% of child mortality. Infant mortality is also high: 62 infants under the age of 1 will die for every 1000 born. Women and girls are especially vulnerable in Mozambique. In the Beira corridor between land-locked Zimbabwe and the Mozambique coast, prostitution is rife, continuing the spread of HIV. Only 12% of women use contraception. 48% of women are married and have given birth by age 18. Only 32% of the poorest women in Mozambique have a skilled attendant during birth, compared to 90% of the richest women. Education is a low priority for girls in Mozambique. 91% of school aged girls will start the first grade of primary school, but only a dismal 22% will continue on to start the first year of secondary school. Compared to men, only 54% of women are literate. However, education is also lacking for adolescent boys. Only 25% of male students attend early secondary school, and a mere 12% go on to be enrolled in upper secondary school. The area of the Tete Corridor, going through Mozambique between Zimbabwe and Malawi, is known as the “Missionary Graveyard”. Hands at Work has been able to expand our work in this corridor where the poorest and most vulnerable children live. We envision the local church effectively caring for the dying, orphans and widows, and unified in this mission with the church outside Africa. 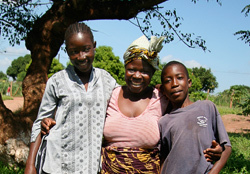 Miguel’s mother, Alima*, cares for Miguel and his three siblings alone. There was barely any money for food, let alone school fees. Even the barren soil around her home seemed to be against her, preventing her from growing a garden and on many days, the family went hungry. At 10 years old, Xiluva* has faced challenges that no child should ever have to face. When her father passed away in 2010, Xiluva was living with her mother and three siblings in Mudzidzi, Mozambique. When her mother remarried in early 2016, she took the children to the community of Macadeira and abandoned them with their ageing grandmother, Orpa*. Xiluva’s world fell apart. For the past four years, Chumai has suffered from epilepsy. His mother decided to return to her family because she could not deal with Chumai’s illness or those of the rest of the family, including Chumai’s father. A few months after leaving her children, Chumai’s mother remarried. Tragically Chumai’s father, Joaquim, died after falling from a platform used to dry maize cobs.